The events in Ferguson Missouri, the release of the movie Selma and the generational passing of many historical Civil Rights champions all bring to mind the history and enduring legacy of efforts to achieve equity and social justice in our country. The role of government agencies in enacting, promoting or ignoring discriminatory laws, redlining practices, Sundown Towns, and other systematic forms of institutional racism are well documented. Even though these practices are no longer condoned (and are now illegal), the ongoing legacy of these practices have recurring and persistent impacts on the society that we live in. Can government use the tools of public administration and management against these historical yet surviving social ills? Can we achieve the fourth “E” (equity) espoused by George Fredrickson along with the three traditional tenants of government: economy, efficiency and effectiveness? Frameworks for equity and an acknowledgment the importance of measuring it exist, but only relatively recently have there been appreciable efforts to actually create and populate measures to understand our equity predicament. 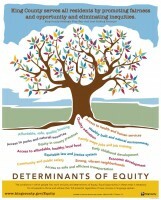 King County has been elevating the issue of equity for several years including adding the principles of “fair and just” to its strategic plan in 2009, adopting an equity and social justice ordinance, publishing regular annual reports on county actions, passing an Executive order to create an equity and social justice strategic plan and even creating an Office of Equity and Social Justice. Although we have known about persistent and significant inequities in the community and measured various indicators at various times, the county only this year completed its first comprehensive indicator baseline. Determinants of Equity: Identifying Indicators to Establish a Baseline of Equity in King County is the county’s first attempt to define community indicators and populate those indicators with data to portray the equity conditions in the community. 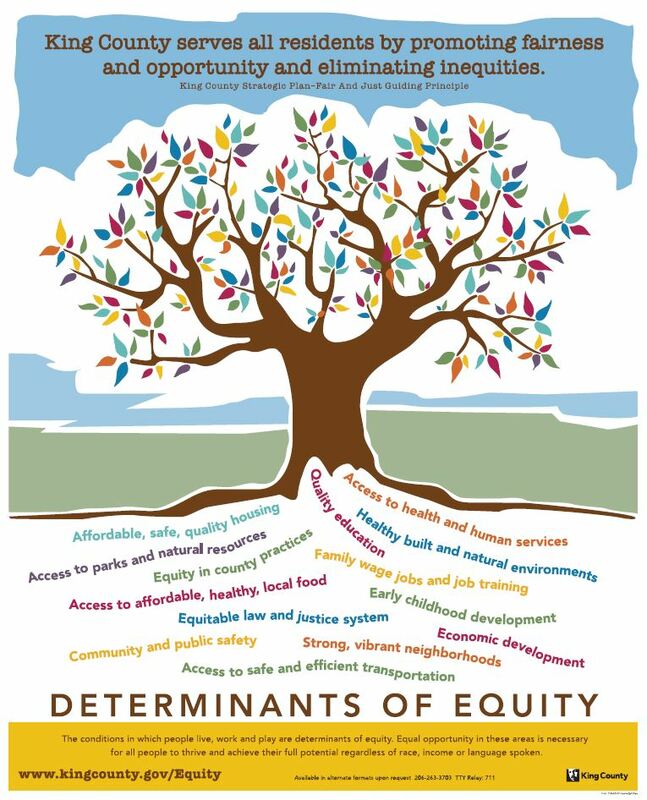 Based originally on the social determinants of health framework, the county adapted that work to reflect 14 key determinants of equity and arrayed them in a “stream” reflecting upstream and downstream issues. To further these issues at the national level, the American Society of Public Administration’s Center for Accountability and Performance (CAP), in collaboration with the National Academy of Public Administration’s Social Equity in Governance standing panel, have chartered a project to identify promising approaches for measuring and advancing the measurement of social equity. Brandi Blessett, Ph.D. (assistant professor, Department of Public Policy & Administration, Rutgers University-Camden). Marc Fudge, Ph.D. (assistant professor, College of Business and Public Administration, California State University-San Bernardino). Tia Sherèe Gaynor, Ph.D. (assistant professor, School of Management, Marist College). Benoy Jacob, Ph.D. (assistant professor, School of Public Affairs, University of Colorado-Denver). Sam Larson (doctoral student, School of Public Affairs, University of Colorado-Denver). These teams will develop databases of existing frameworks, evaluative findings of current practices and gaps, case studies, and presentations and articles based on their research. As the work progresses, each team will look for promising findings on equity measurement to further the important work of measuring and improving equity in our communities and across the nation. Unfortunately, all the data in the world won’t solve the deep problems that we already know exist. We do need better data, information and analytical insight to help identify causality, elucidate our program theory and to evidence whether or not we are making an impact with our policies, programs and interventions. 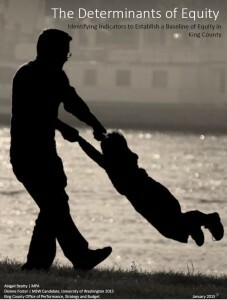 Fundamentally, what is needed (and what the best framework or report can only support but not provide) is leadership. Leadership to call these issues to the fore, to take a stand that equity is a primary public policy goal and to use equity as one of the standards by which we make decisions for the public good. Author: Michael Jacobson is the deputy director for Performance and Strategy for King County’s Office of Performance, Strategy and Budget. He was the 2013 winner of the ASPA Center for Accountability and Performance’s Harry Hatry Distinguished Performance Measurement and Management Practice Award, is the incoming Chair of CAP, and a co-sponsor of the ASPA CAP/NAPA social equity measurement project described above.